This was my first Daring Bakers Challenge that didn’t scare the bejezus out of me. It was nice to just take a couple hours to put together this classic tart. I thought about what to fill the tart with for a while, then finally asked my family what they wanted. My brother requested something creamy/custardy, my mom requested lemon. 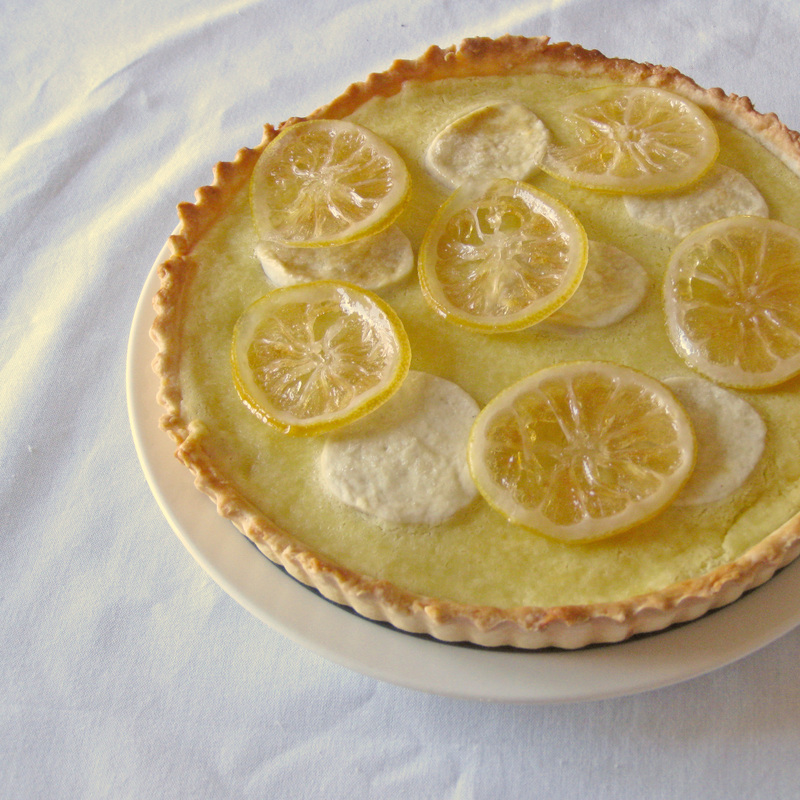 And so my lemon scented custard crostata was born. I wanted to try a lattice top to the tart, but I wasn’t able to slice the into even strips so I chose to cut out circles of dough instead. Once the crostata had baked I topped it with some of the candied lemon slices I made. The crostata was delicious, but I think baking it in a tart pan was a mistake. To me a crostata should be more rustic looking, like it just got thrown together by an italian nonna on a Sunday afternoon. I thought about making another one, but my ever expanding waistline talked me out of it. There is a lot of baking to be done leading up to Christmas, and I need to choose my calories wisely. Make the crust: In a large bowl whisk together the flour, sugar, and salt. Add the butter to the flour and rub the mixture together until it has a coarse crumb consistency. Make a well in the center of the butter flour mixture and pour the egg into it. Use a fork to blend the dough together. Knead the dough lightly, then form a disk. Cover the dough with plastic wrap and refrigerate for at least two hours. 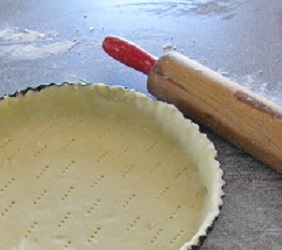 Once chilled, cut 1/4 of the dough off then roll the remaining dough out and place into a 9 inch tart pan. Chill the rolled out dough for 30 minutes. Dock the pastry (poke little holes), cover with parchment and weigh the crust down with pie weights or dried beans. Bake for 15 minutes at 350. Remove the weights and let the dough cool. Make the filling: In a large saucepan heat the milk and lemon peel slices until steaming. Let the milk and lemon steep for 10 minutes. Remove the lemon peel. In another bowl, mix the eggs, sugar and flour together. Pour a small amount of the milk into the egg mixture, whisking constantly and quickly. Slowly pour the rest of the milk into the egg mixture, always while whisking. Pour the custard back into the saucepan and warm at very low heat, stirring often. When the mixture starts to thicken, turn the heat up higher and cook one more minute, whisking constantly. Remove from the heat and stir in the limoncello. Pour the custard into the tart shell. Roll out the remaining dough, cut into strips or shapes and place on top of the custard. Bake in a preheated oven at 300 degrees for 30-35 minutes. Decorate with candied lemon slices. I was originally planning on make a lemon curd one, but the lemon scented custard sounds even better. A beautiful crostata! A GORGEOUS take on this month’s challenge! Well done! This is gorgeous. Can almost taste it from the picture. Beautiful. I love everything lemon, so I would totally go for it. And the limoncello? Wow, no, that’s not optional I bet it made it just perfect! My goodness…this is a wonderful flavor for crostatas!! Wonderful crostata :) Well done DB challenge! I can’t wait to see what they have for us next month!! Yum! I would love to have a slice of this right now. Random question – aren’t lemons a summer fruit? I was at the farmers market the other day and i saw tons of buckets of lemons… I was surprised by that. I always thought they were a winter fruit, but I could be mixing them up with oranges. Beautiful crostata! And lemon – oh dear…. Great job!!! It looks lovely, even in the tart pan. But I do know what you mean about wanting it to look rustic. Either way, I bet it tasted delicious! your crostata came out great!! and I think with a lemony custard filling the candied lemon slices were a much better idea than a lattice crust. Great job with your challenge! OMG Gorgeous! I love all things lemon, this is beautiful! This looks so tasty. It looks just like something my husbands nonna would make. Wonderful, I especially adore the filling. The lemon slices on top of this one are just beautiful! I can almost taste them from here. Just lovely! This looks great. I’ve always wanted to make candied lemons. It looks like they go great with this crostata. Well done. You’ve inspired me with this lovely lemon custard crostata/tart with it’s candied lemon slices. I would make this today if I wasn’t away from home this weekend and were it not for the ever expanding waistline situation! I will try this later for a dinner party because who doesn’t love a scrumptious lemon dessert like this?? I know I do! Looks great, and the lemon custard sounds awesome! Yum! Your crostata turned out looking great! I loved the lemony hint in the crust, carrying it through the filling must have been very tasty! looks so perfect and yummy! fabulous job! Oh my…this just puts my little tart to shame. Your crostata looks beautiful and very very tasty! Your crostata looks very nice. I like the candied lemon slices on the top. And I am glad the challenge was pleasant for you.